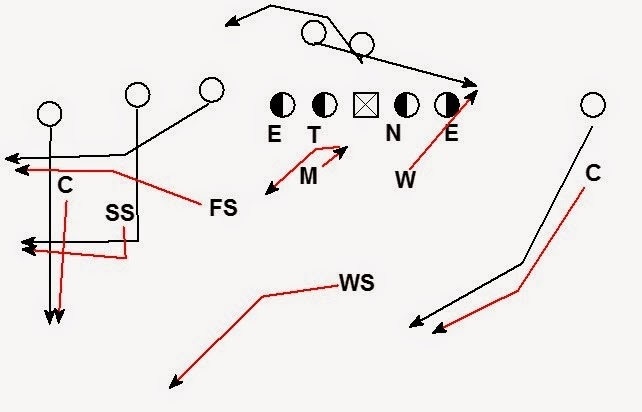 This is part three of a series about Cover 1 (Man Free) coverage in the 4-2-5 defense. The topic this time is defending action passes. Our goal is to keep the action pass rules as simple as possible. The Mike and Will are playing Fiddle (2 on 1) technique vs. the running back. On the action the LB’s play run. 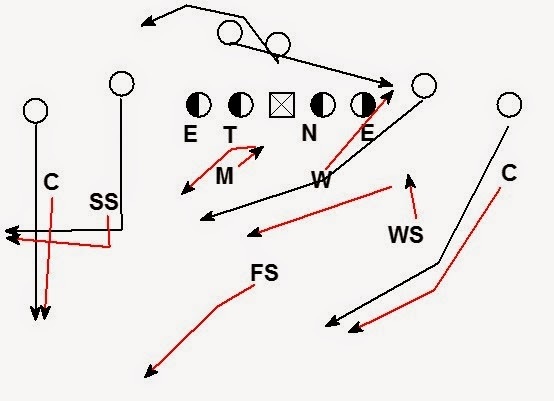 The LB to the side of the action (here the Will) plays man coverage on the RB once pass is identified. If the RB is running a throwback route the Will must handle the route. The LB away from the action (here the Mike) must open up and cover the crosser. It is critical the Mike plants on this right foot and opens over his left shoulder. If the Mike open’s up over his right shoulder, the crosser will easily run by him. The Mike’s landmark is the hash (college field) at 10 yards from the line of scrimmage. As the Mike gets to the hash, he will find and cover the crosser. We teach the aiming point to get the LB to take an angle that cuts off the crosser. The WS will likely make a “cut” call in this situation. He will be late reacting to the pass. Once he identifies the play is a boot, he will work to get back on top of the crossing route. The WS can expect help from a LB. 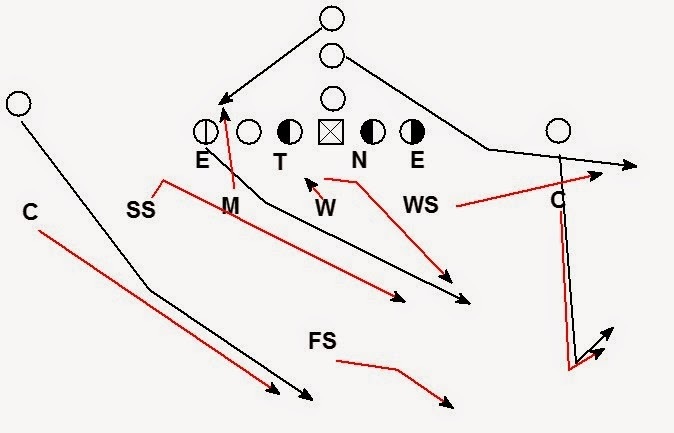 If the crossing route settles before getting to the opposite hash the WS will have the route defended. The FS will squeeze from the middle of the field to a landmark halfway between the hash and the numbers (college field). This landmark is roughly the high school hash mark. All other man coverage players remain in man coverage. The LB may not have a crossing route to cover. His reaction and aiming point remain the same (Hash at 10). The LB to the RB will go man cover the blocking running back and become an extra pass rusher. The LB away from the sprint will take an angle to the hash at 10. As he works to the hash he should find the crosser. When the backs split on the boot action the outside funnel players (here the WS and Mike) have the RB's man to man. The Mike must be aware of throwback. The middle player in the funnel (here the Will) must cover the crosser by getting to this hash at 10 aiming point. 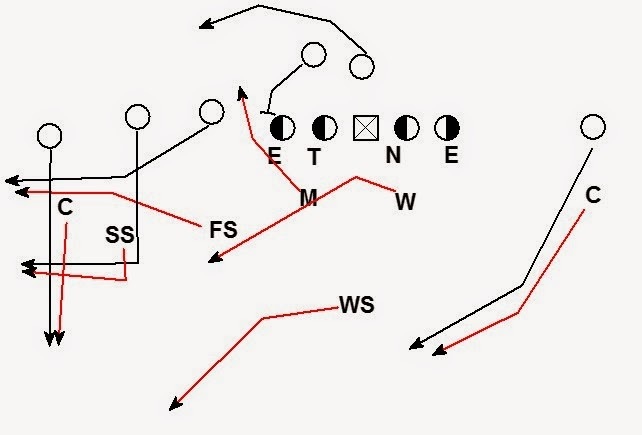 The SS will make a "cut" call end up trailing the crossing route. When both backs release to the same side, the outside of the funnel (here the WS) and the middle of the funnel (here the Will) have them man to man. The Mike will work to the hash. 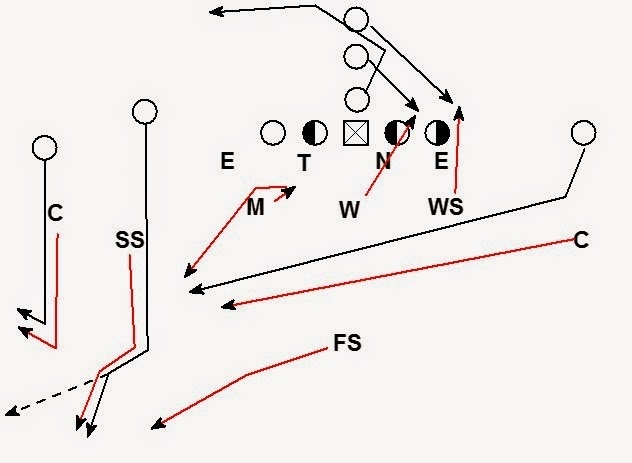 Against a corner route by #2 the SS will work to lean the corner route vertical to the FS. The free safety should be able to provide more corner route help by working to his new landmark halfway between the numbers and hash.